The Quick Access Toolbar is for your frequently used functions. To add a quick access application button - right click on a button from the ribbon and select "Add to Quick Access Toolbar". Remove a quick access application - right click on a button from the Quick Access Toolbar and select "Remove to Quick Access Toolbar". You can also drag buttons to relocate them in a preferred order. Reload - The Reload function is used to refresh the local qvWise database with your latest ConnectWise data. Once a Reload has been performed, you no longer need to be connected to the SQL server. Reloading can be automated in the Model Setting by going to the qvWise Toolbar > Settings and select the number of minutes between reloads. NOTE: After changing the time, you will need to close current qvWise / select another model for this to setting to apply. Save - Saves any changes you've made to the current qvWise document. You will see the saving window appear during the save process. File - Option to save your dashboard to a different location or with a different name. Also possibilities to print, export, clear, reload or close the document from here. 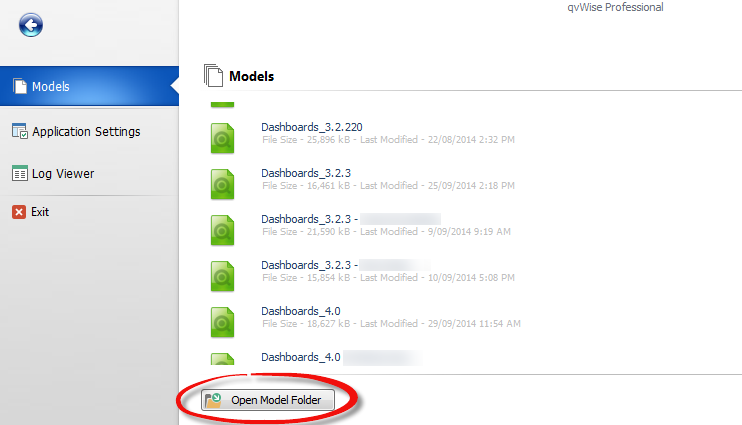 Displays the current model name that you have loaded. This displays the qvWise Version you are using. Controls the qvWise window (minimise, maximise and close).